It appears to be beyond the capabilities of many people to work out what their own email address is and to use it to sign themselves up for online services rather than using one of my email addresses. It's irritating and takes time away from my work. In 2017, Tammy Hembrow signed herself up repeatedly to Kik, each time using my email address of her own. This produced a torrent of spam, including several photos of a scantily clad Tammy. Kik Messenger is an anonymous chat programme which has seems rather seedy and has a reputation for being insecure. It's also been quite controversial for various horrible reasons. I really wanted nothing to do with it so repeatedly sent requests to their support email address asking that the account linked to my email address be removed, only to repeatedly find myself signed up again. It's been a while now since I received any of their spam so perhaps this was eventually resolved. Tammy was quite persistent on Kik and the same Tammy seems to have signed me up to something called "aeo connected". Discount vouchers for an online clothing shop ? I'm no more interested in that than I was in Kik messenger. Tammy: Please learn to type your own email address. In 2018, Winnie Hembrow signed up for Mercado Libre, a sales website which seems to be used mainly in Mexico. Everything is in Spanish on the website, and the spam that they sent me was also in Spanish. Because Winnie had reacted to several sellers and asked questions about their products I was sent replies to her questions about items that I've never had an interest in, in Spanish, for several weeks. I reset the password and set the displayed name for the account to "This user does not exist". Winnie won't be able to use this account any more because I reset the password. If she had used her own email address this wouldn't have happened. 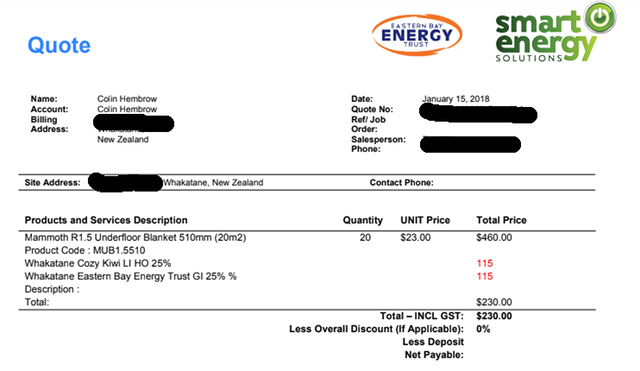 In early 2018, Colin Hembrow asked for a quotation about installation of underfloor insulation in his home in New Zealand. It's a great idea to do this, we did the same to our home and it's amongst measures which have cut our energy consumption significantly, but you will only receive a reply to your request if you remember to use your own email address. Also in 2018, Courtney Hembrow signed me up for monitoring of patient care in Calvary, Australia. I've been asked to fill in a survey on her behalf. They provide no means for feedback, only a "do not reply" email address so I filled in their survey as the freeform text boxes were the only way of providing feedback about their having sent email to the wrong address. Hopefully they will remove my email address from future mailings. On the 23rd of October 2018, Lindon Hembrow of Peace River, Alberta, Canada took his 2017 Ford Focus car for servicing at Peace River Ford. How do I know this ? 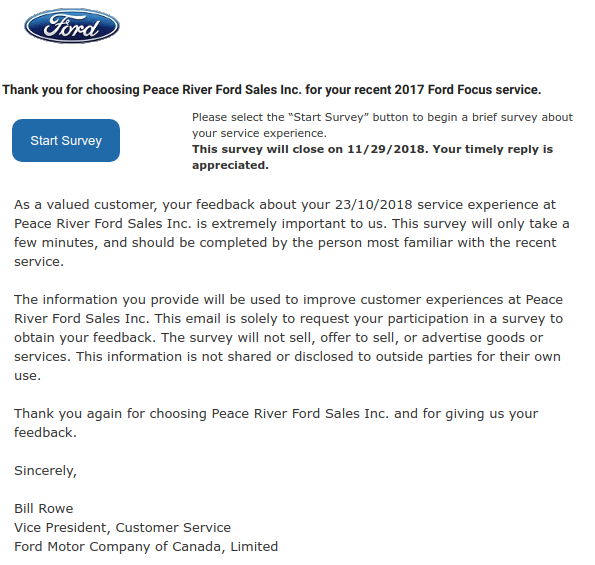 Because on the 31st of October Peace River Ford sent me email to ask for feedback about his experience. When Lindon went to collect his car he was given the keys to a 2001 Focus with ten times as many km on the clock, dents in every door, a crack in the windscreen, a blood stain on the driver's seat, someone elses rubbish in the footwell and a dead body on the back seat. He's been driving that car every hour since the 23rd of October because the dead body is now controlling him. On the 23rd of October 2019 the haunted Focus will return to Peace River Ford with more dents, more blood and an extra body on the back seat. If you have your car serviced at Peace River Ford you could be the next victim. I suggest that Lindon makes sure that in future he definitely uses his own email address when filling in forms. Of course he might already have done so so I also suggest that Peace River Ford make sure they use customers' correct email addresses for sending out surveys. Oh, and I also suggest you stop driving cars. They're a disaster for the planet and all of us who live on it. Everyone would benefit if Lindon, the good people of Peace River and everyone else rode bicycles instead of driving. Should any of them then buy bicycle parts from us and give their correct email addresses when doing so, we will take care that no-one's private information is spammed around the internet to the wrong people. 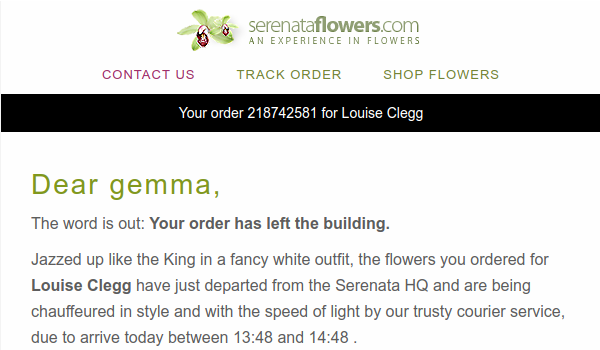 On the 11th of November 2018, Gemma Hembrow ordered flowers from seranataflowers.com (a business based in Malta, presumably to avoid paying tax) for delivery to Louise Clegg of Bromley on the 12th of November. How do I know this ? Because Gemma Hembrow doesn't know her own email address and used mine instead. Serenata Flowers sent Louise's full address to me, which is a bit of a data leak, though probably not a very important leak because her address may well also be in the phone book for anyone to find. If I had a lodge and Robert Taylor was a member I would of course happily accept his resignation, but first I'd check that this really was his resignation. I would most certainly think twice about someone else offering anyone's resignation from anything, even if they had the same surname. This might be important. I don't know. Anyway, as I've no idea who this email was supposed to go to, and it seems that the person who sent it has no idea either, Robert will probably remain a member for the forseeable future.